Danny Attree’s Halcyon Nostromo model. With navigation lights! As the crew of the Nostromo find out, you never really know what you might find out beyond the Outer Rim. The internet can be just as mysterious (though maybe less grisly). I’ve been searching it for Nostromo items for so long now my keyboard has ruts in it, but I have learned that there is always something new to discover…and this post today certainly proves that point, when I met Danny Attree. Danny’s Halcyon Nostromo is a most amazing accomplishment! I think we can add him to the list of accomplished model-makers willing to take on the challenge of completing the 26-year-old Halcyon Nostromo kit. (It was released in 1992). Danny did not stop with merely assembling the parts. No, he went far beyond that, proving he knows his Nostromo. While the antennae, landing gear, blast shields, and a handful of other parts are plastic, the body of the ship is vinyl, which usually has not stood the test of time and must be whipped back into shape with gentle heat and steady patience. Danny did the deep research and found as much on-screen reference material as he could. As he worked the details into the model, it is interesting to read about the steps he took, as you will see a little later. I’ve seen these kits with the landing gear lit up, and with the pin-point lights seen in random spots on the hull, but Danny has really taken this one to the next level. Remember these impractical and massive light sources (along with the wheat-bulb lines of light) that switched on at Dallas’ command? Screencap from Shadow of Reflection website. An artistic decision typical of Ridley Scott’s visualist approach, those giant spotlights dangle improbably from the rear of the ship, yet they serve to underscore the drama of the moment as the crew struggle to bring the ship down in one piece! Danny has done an artful interpretation of these details in his kit-build, having lit the bridge windows as well. He filled out her lines and did some gentle weathering that fits the bill quite nicely. I really dig this shot of the model! It shows off Nostromo’s funky geometries that have always made me think the ship is slowly falling apart, still flying “on a wing and a prayer.” (Photo property of Danny Attree). 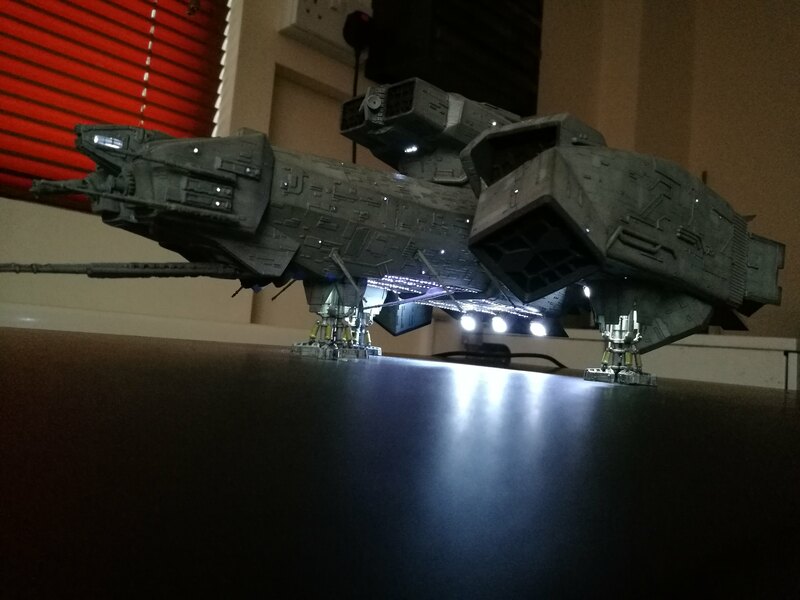 Thanks to Danny for commenting on a recent post with information about his Nostromo build, and for sharing the weekly progress reports. Previous ALIEN Official Poster Magazine #2 (1979). Next Deck designs, à la Ron Cobb.